Inside, tables are filled with mix of students, young families and a few reassuring groups of older Asian diners. The restaurant is decked out in black veneer and polished glass with the etches imaging of a smiling Pappa holding a cup of tea, which reminds me of the friendly smile that both my father and future father-in-law bring, when they drink their tea every morning. An open kitchen runs down one side but much of the dirty, smelly work is discreetly done out the back. Malaysia's food is a reflection of its population, a union of Indian, Chinese and native influences. I was fortunate to witness this first hand approximately three to four years ago, when my future father-in-law pleasantly took me around to many of the authentic food outlets in Penang, Malaysia. It is with modesty that I say Brisbane PappaRich displays a balance in resemblance of style and texture to that of the homeland, although food in Penang is approximately eight times cheaper. Smiley staff hands out bound menus like photo albums, the pages filled with glossy pictures of almost every snack, noodle and rice dishes, dessert and crazy iced drink (no alcohol here, though). PappaRich has a preprinted list of menu items on a block pad and preferences can be selected with space to individualise the contents of the dish (such as commenting on the degree of spiciness). When one is ready, a button on the table is pressed and the staff will pick up the order. 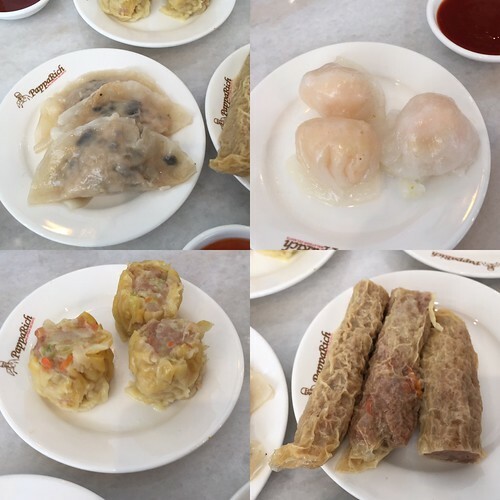 The dim sims were well served as entrees, and complemented the drinks of Pappa Mocha, open sesame and iced tea and jelly. 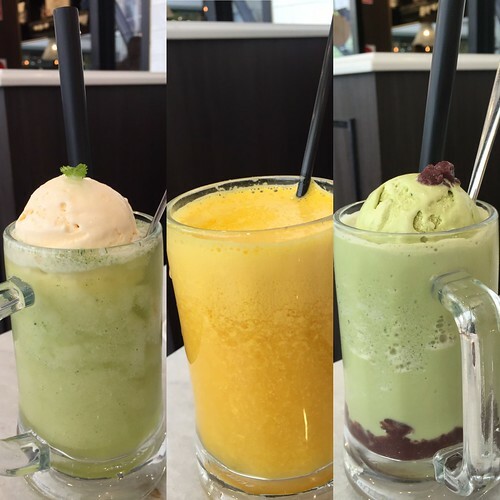 All these drinks were colourful, came in a super large mug and were particularly refreshing given the looming Brisbane summer. We tried the Vegetarian 'Sui Kau', the Vegetarian 'Fu Chook' rolls as well as the prawn and chicken dumplings. These were steamed with fresh ingredients and the accompanying sauce added appropriate flavour for those who enjoy a touch of chilli on the side. 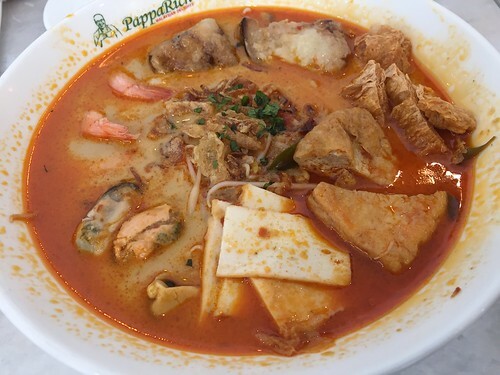 Ordering the seafood curry laksa was one of the highlights at PappaRich. Several unique touches put this curry laksa in a league of its own. It is a bonanza of seafood with whole prawns, calamari, fishcakes and vegetables. 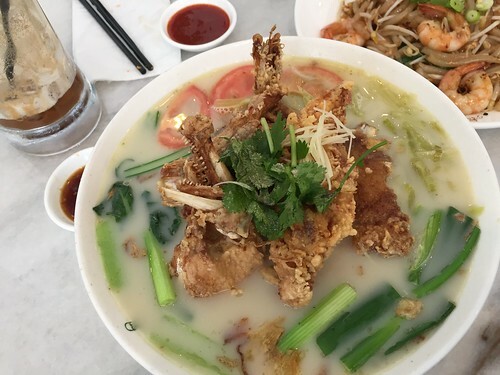 The broth is rich, moderately creamy and mildly spiced. One is given a generous handful of bean sprouts under a tangle of thin egg noodles. It was a delicious start to the mains. PappaRich's fish head noodle soup arrived next, which not only looked great, but also tasted great. One could appreciate the infamous milky white broth. The dish was not fish smelling as the fish had been fried, and then simmered with ginger, pickled mustard greens and some tomatoes. It was a flavourful and appetizing dish. It is difficult to walk away from the Pappa Fried Rice Noodles aka the 'rat's tail noodles'. 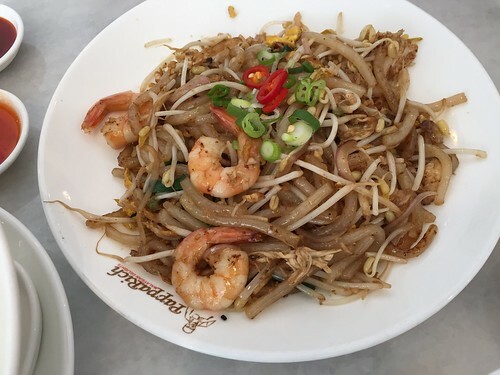 This dish contained wok fried noodles, prawn, shredded chicken, egg and bean sprouts. The chef did an excellent job cooking it to the level of appropriate spice and I enjoyed digging into the juicy prawns. The amount of oil was minimal. Finally, the chicken congee that comes with steamed chicken was second to none. 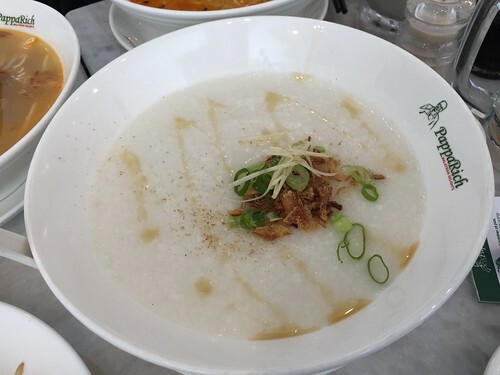 The congee had a moderate degree of chicken taste and the steamed chicken pieces were moist, tender and flavoured with soy sauce. Naturally, we were quite full after these entrees and main meals, and we did not have the stomach capacity to order any further, but there were a host of other dishes that were popularly selected by other diners. The Nasi Lemak was served with a white dome of jasmine rice, served with curry chicken. It looked glamorous and was commented by others to be delicious. A few diners critiqued that PappaRich's satay was delicately cooked and many enjoyed the crunchy peanut sauce, fresh cucumber and red onion. We are looking forward to trying these next visit. By the end of these meals, we proceeded to hydrate ourselves, and we tried the Matcha rocks, tropical lime and orange juice (with a special request for no ice or sugar). The drinks were individualised to our needs, were lightly sweetened with a tangy taste and complemented the Tau Foo Fa well. 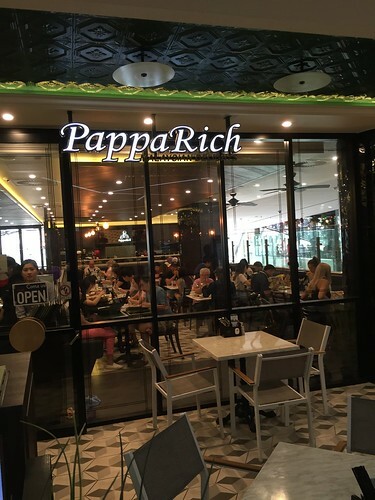 Overall, PappaRich is as good as restaurant franchise will get. Everything is systematic; the place is clean; the food is decent and the staff are efficient. We enjoyed our meal thoroughly and we will come back again to try other dishes. However, sometimes you just wish to sit on a plastic stool on a side street and be served by crude staff and food cooked from a well used wok over flaming charcoal. PappaRich is a Malaysian wonderland and a much welcomed oasis for all weary shoppers in the Brisbane city. For the price, it offers delicious quality meals sure to delight the stomach and budgets of most. The Mr received complimentary lunch at PappaRich but all opinions were entirely his own.